Yesterday, I wrote about Brandon McCarthy‘s injury being an opportunity for Zach Lee. Now, Carl Crawford‘s injury is an opportunity for someone — but not a prospect. 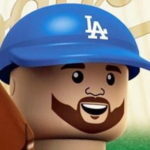 Scott Van Slyke might get his chance to show what he can do. Some folks draw the (probably lazy) comparison of Van Slyke to former Dodger and fellow bearded lumberjack in the offseason (probably) Jayson Werth. Once Werth got to Philadelphia and played full-time, he took off. I’d be really surprised if Van Slyke had a Werth-like ascendance to stardom, but we all know just how valuable he is to the Dodgers. The similarities are somewhat present, but to expect Van Slyke — a guy who was removed from the 40-man roster just three winters ago — to turn into Werth (minus the reckless driving, hopefully) is quite optimistic. The numbers since 2009 (Werth’s first season as a true full-time player) tell a different story. Let me preface this by saying Werth has a more than 10-to-1 lead on Van Slyke in terms of plate appearances against right-handed pitchers (2,641 to 238), but the rate stats are close. All pretty similar, except for Van Slyke’s alarming strikeout rate. But he actually has the slight advantage in weight runs created-plus. That’s surprising. And they both destroy left-handed pitchers (Werth also has a 3.6-to-1 advantage in plate appearances). There is no denying Van Slyke’s ability, and he probably should get a chance to start. But that won’t come with the Dodgers, unless there are significant and long-term injuries. Where Van Slyke has an edge against Werth is, surprisingly, on defense. He has been positive in the corners in terms of defensive runs saved and UZR/150, while Werth has been negative in both. Yasiel Puig will probably be back in less than two weeks, so this is a short-term trial for Van Slyke. Andre Ethier‘s surprisingly strong play has all but guaranteed he’ll slot into left field (against righties) when Puig returns. Crawford’s “bad” torn oblique doesn’t have a timetable for his return, but I’d be surprised if he were back any sooner than a month or two. Like Mike said when he wrote about Alex Guerrero, this is a good problem to have. The fact the Dodgers have this much depth and quality players cannot be a bad thing. And if you thought Guerrero was buried on the infield/third base depth chart, just wait until Enrique Hernandez is drawing starts ahead of him in the outfield (and it will only get more difficult for Guerrero once Puig returns). There’s no saying for sure that Van Slyke would keep up those numbers if he played full-time, but I’m guessing his production against righties would dip. He’s always going to be a left masher, though. And also as Mike said in last night’s thread, most teams would be in full-fledged panic mode with these injuries. It’s business as usual for the Dodgers, and they might actually benefit (on some level) by playing Van Slyke ahead of Crawford. Perhaps that could be a thing down the road, but Van Slyke will need to perform to make that a reality.